More than any other city in America, New York in the years after the Second World War carved out an idealistic and equitable path to the future. Largely through the efforts of its working class and the dynamic labor movement it built, New York City became the envied model of liberal America and the scourge of conservatives everywhere: cheap and easy-to-use mass transit, work in small businesses and factories that had good wages and benefits, affordable public housing, and healthcare for all. 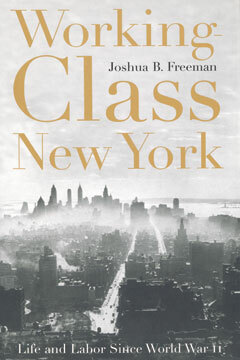 Working-Class New York is an “engrossing” (Dissent) account of the birth of that ideal and the way it came crashing down. In what Publishers Weekly calls “absorbing and beautifully detailed history,” historian Joshua Freeman shows how the anticommunist purges of the 1950s decimated the ranks of the labor movement and demoralized its idealists, and how the fiscal crisis of the mid-1970s dealt another crushing blow to liberal ideals as the city’s wealthy elite made a frenzied grab for power. A grand work of cultural and social history, Working-Class New York is a moving chronicle of a dream that died but may yet rise again.